On December 23, 1941 Chuck Older destroyed two army 97 bombers while trying to defend Rangoon from over 100 enemy bombers and Fighters. On Christmas Day over 150 Imperial Army Air Force aircraft returned to bomb Rangoon again. The AVG sent 13 P-40C Tomahawks and the British No. 67 Squadron sent 14 Buffalo fighters to intercept. Chuck destroyed two more army 97 bombers and a type O enemy fighter to become an Ace. Total enemy artcraft losses amounted to 25 aircraft, while two AVG aircraft had to be written off and four RAF pilots were killed. This image depicts Lt. Colonel Charles E. Older's 3rd victory, December 25, 1941 over Rangoon, Burma. Col. Older had 18-1/4 victories. 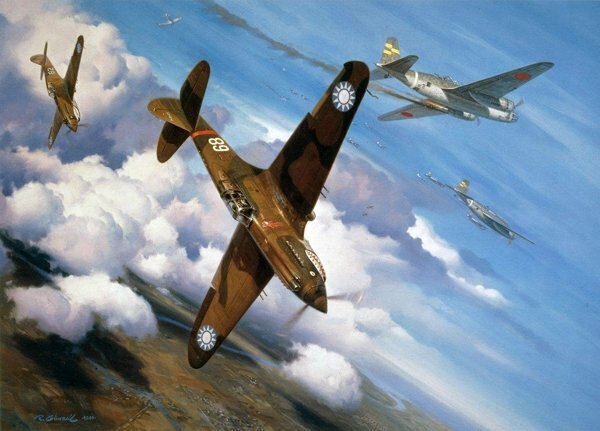 This limited edition lithograph is hand signed by several P-40 Flying Tiger Aces, Chuck Older, Ken Jernstedt, R.T. Smith, "Duke" Hedman, and Parker Du Pouy. It is also signed by artist Roy Grinnell.